One of the important conversations I try to have with any potential client is educating them on the differences between a full service wedding planner, a partial wedding planner, anyone calling themselves a coordinator, and anyone considered a venue coordinator. If you want to catch part two to this post focusing on designers versus florists, be sure to sign up for tomorrow’s newsletter which will have all the details for you! See, our team does many things under one roof, but for the sake of this post I want to do my part to help educate our industry and better inform not only couples getting married but any business owner who may feel conflicted on their roles. Differentiating the services and roles of the many wedding services professionals provide when it comes to any sort of production, management, planning or coordination is crucial to making sure you’re getting the service you want, need, and more importantly, are investing in financially. Here are the most common services/roles you’ll find when searching for wedding planning assistance. A wedding planner is one of the most common wedding roles/job descriptions and there are different types of wedding planners under this job title. There are full service wedding planners and partial wedding planners. There are also event planners who may focus more on events outside of the wedding sphere (think corporate or gala planning but that’s a discussion for another day). 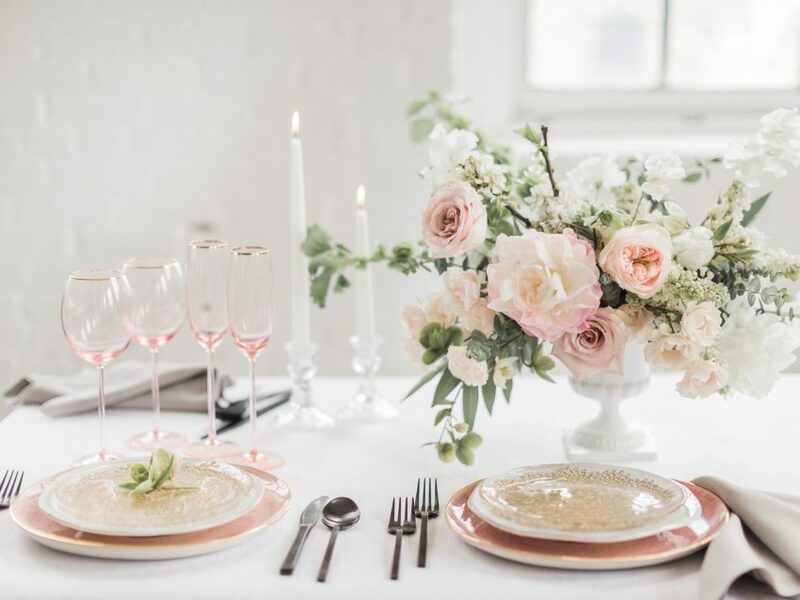 Most of the time when a couple needs or wants help planning and executing the entirety of their wedding, a wedding planner is a great first place to start. Because of how we operate within my company, I’ve always firmly believed that a full service wedding planner’s role is to be your advocate every step of the way throughout your planning process. Typically, a full service planner is hired immediately after an engagement and is responsible for countless things along the way leading up to ‘I Do.’ From keeping planning progress on an appropriate timeline, suggesting vendors that fit in with your budget and style, managing communication between said vendors, and being present at meetings for or with you, a wedding planner can be a key player in making your wedding day truly come together from the ground up. There is not much that a full service wedding planner does not have a hand in but every planner is different so it’s important to really educate yourself on every planner’s company culture and values to ensure your expectations are met and needs fulfilled. A partial planner is usually hired to come on board and help with the planning process much closer to the wedding day once a couple has done a lot of the leg work planning their wedding already. A couple reasons a couple may choose a partial planner over a full service planner include budget restrictions (full service planners are responsible for a much bigger time commitment which means more working hours for obvious reasons = a higher price tag), or some couples want to do the planning themselves, are having a low key wedding, may be getting married at a fairly all encompassing venue, etc. There are many reasons why a full service planner may not be a great fit for a couple again driving home my point about really educating yourself on what services are going to be provided to you (many planners list on their website what services they do and do NOT do). So let me illustrate this major difference for you! When it comes to understanding the difference between a full service planner and a partial wedding planner let’s imagine the options available to you should you be looking to hire a contractor to finish your basement. Some homeowners may opt to hire a company to completely oversee the finishing process on their behalf (and of course with their input). The contracted company will serve the client by understanding their needs and then do the leg work to source materials, contract labor, and get the job done to the client’s expectations. It’s very much a start to end process where the client does very little except sign off on decisions, share input, and cover all costs. Where as some homeowners may choose to head to Home Depot in their spare time, source out their own materials, borrow a friend’s truck to get it all home, unload it all themselves into their garage, search Pinterest and Google for inspiration, maybe do a facebook shoutout looking for contractor suggestions, and THEN once they have found who they feel is right for the job, bring someone on board to make sense of all the work that’s already been done before handling the actual labor part. In the end the basement gets finished by a professional in either scenario but the work leading up to the finished product was done very differently and with very different associated price tags. Some planners charge a flat fee, some charge a percentage fee for production (like we do now), and some charge hourly (in my opinion this is more appropriate for partial planners as it’s less hours to manage/keep track of) but all planners SHOULD be your representative not only throughout the planning process but on your wedding day to run the show and ensure everything unfolds according to expectations. This means on day of meeting/greeting vendors, being a liaison for the couple, following a tight timeline created in advance of the wedding, keeping everyone on schedule, being available for questions and concerns both from other staff and guests, anticipating problems before they arise, and handling problems that unfold as efficiently as possible. A wedding coordinator is very different than a wedding planner. I’ve made it my personal mission to make it known that these two roles are very different from one another, and always do my best to educate potential clients on what type of company or person they should hire IF I can tell they are confused or uneducated (and this is usually with clients that do not hire me since we don’t offer stand alone coordination services. I share this here today with you reading to illustrate that even if I cannot best serve a client as a full service planner and designer, I try my best to point them in the direction of someone who will). I also want to make it clear that the term ‘day of coordinator’ is not truly indicative of that person’s role. I don’t think there is anyone who can truly do ‘day of’ coordinating and here’s why: if you’re hiring a ‘day of coordinator’ to just show up on your wedding day and magically know what needs to go where, who is who, what your expectations are, what the timeline is (speaking of which, where does said timeline come from when someone is working ‘day of”? ), well there’s really no way this would feasibly happen. For a ‘day of’ coordinator to do their job well they need to come on board to the planning process at least a month before the event to get caught up to speed on everything that’s been done, as well as prepare a plan for the wedding, and get to know all key players involved. Many coordinators call this service ‘month of coordinating’ which is more appropriate but I believe this is actually what ‘day of coordinating’ encompasses; at least a month of work leading up to the wedding day. This is another conversation to have entirely within our industry because there are differing opinions but I think changing commonly misused verbiage here would help streamline many businesses and ensure client’s aren’t overwhelmed, misinformed or confused with their options. As for the role a full service or partial planner may play on the wedding day: s/he is typically responsible for managing all involved vendors and companies, handling final payments (not floating money) and gratuities on your behalf, and fixing any problems should they arise. This really just scratches the surface of what a planner should do within their coordinating duties. By the time your big day arrives, the person you have hired whether they are considered a planner or coordinator will know you, your fiance, potentially your family and friends, and ultimately your wedding day vision in every form and capacity possible. And in my personal opinion if you really find the perfect fit in a wedding planner, they will become a friend (or in the very least, a pleasant memory) in your life long after your wedding has come and gone. A venue coordinator is NOT the same as a full or partial service wedding planner. And a venue coordinator is also very different than a month of or ‘day of’ coordinator. While many venue coordinators or managers differ in their level of involvement and attention with each wedding, as a general rule, if there’s anything you take away from this post it’s that. Your venue coordinator(s) or point of contact is NOT a wedding planner even if they have wedding planning experience. This does not mean a venue coordinator is bad, inexperience, unprofessional or not necessary. It’s actually quite the opposite (assuming your venue is at an actual venue and not in a backyard, field or space where everything is built from the ground up and every staff member is brought in from different companies). A venue coordinator is a crucial piece to ensure a flawlessly executed event, and even more so when this person and your outside planner/coordinator can work efficiently together to serve you best. A venue coordinator’s role is to service the venue and ensure venue related tasks, problems, and staff are taken care of. Most of the time, their roles and responsibilities end there and things not pertaining to the venue specifically become the client’s responsibility (or an outside planner/coordinator’s responsibility). For example, a venue coordinator is responsible for providing you with a list of rules and policies of the space like noise ordinances, candle restrictions, guest capacity, and more. They also ensure washroom needs are met, venue spaces are ready for vendor set up, help keep the catering staff on schedule when catering is done in house, and so on. But a venue coordinator will not attend a bridal gown appointment with you nor will they provide you with opinions on how long hair and make up services should take in the morning for your bridal party of ten women. They typically aren’t taking phone calls with clients to handle sticky etiquette dilemmas like invitation ‘plus ones’ or trying to help you decide who should cover the rehearsal dinner bill. If there’s something that doesn’t pertain to the venue specifically, it’s happening outside of the venue, or if it’s very personal in nature, it’s typically not a venue coordinator’s responsibility. Most venue coordinators are a part of a larger team and have a superior to report to. They’re often managing many events in one weekend (meaning a lot of couples to connect with during the work week versus the few an outside planner will likely take on), and a lot of the weddings they oversee are like clockwork; in the same place, with similar floorplans, and repeat vendors in the mix. The way they are compensated financially is very different than how an outside planner is paid especially if an outside planner is self-employed versus working under someone for an outside company. Again, I want to emphasize that a great venue coordinator is a wonderful asset. Some of my favorite weddings and least stressful events have been ones where a wonderful, helpful and accommodating venue coordinator and team has worked WITH my team to make the one common goal come to life; and that’s ensuring our couples have a day that exceeds all expectations. My advice to couples who tell me (or think) that they do not need a planner or coordinator because they have a venue coordinator is to be very clear on what your venue coordinator will and WILL NOT do. 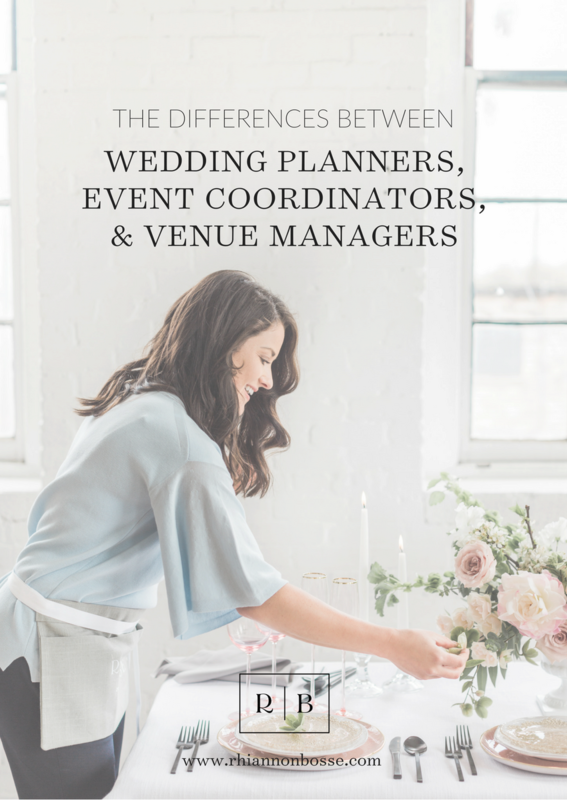 From there you can assess how much help you believe you will need beyond the venue’s offerings, and then considering my above breakdown of other planner roles, can begin your search for the perfect person to join the planning process! As I mentioned at the beginning of this post, we do many things here at Rhiannon Bosse Celebrations. We are a full service planning team that not only plans, produces, and the executes the wedding day itself, but we design each wedding we take on and provide the floral elements all made in house. If you want to hear more about the differences between wedding designers and wedding florists which encompasses how we do EVERYTHING under one roof, be sure to sign up for tomorrow’s newest email campaign. And I’d love to hear your thoughts and commentary below. Wedding professionals, what do you call yourself? How do you help educate your clients? Join in the conversation! What if a client wants to work with someone to help achieve/ creative a vision? I’m keen to handle site booking and vendors myself, but would like someone to help with the vision (OK with a virtual partnership). What would that be called? Is that something you guys handle? Thank you so much for this. I was so consufed with all these names and had no idea about the difference about them, but now I know exactly who to hire. Thanks!! !